Please make sure your child gets a good night’s sleep (6-8 hours) the day before test day. Also, ensure that your child eats breakfast on Wednesday morning, so that they have the energy and presence of mind to think critically and perform well. Make sure your child arrives to school on-time for testing. 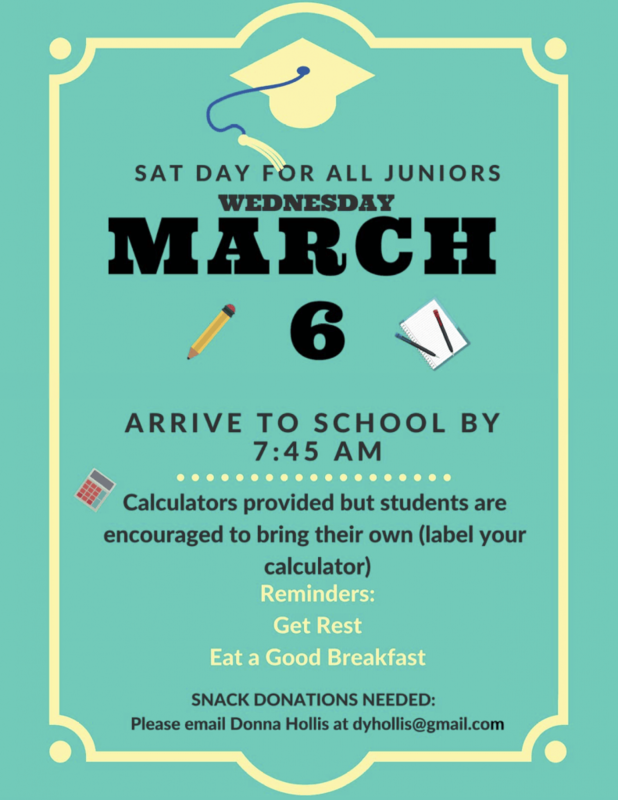 Juniors should report to Duke Ellington for SAT exams by 7:45 a.m. to check-in and receive calculators, pencils and instructions. SAT testing will begin promptly at 8:30am. Late students will NOT be admitted once testing has begun. Snacks will be provided for SAT test-takers during approved breaks. NO CELL PHONES or HAND BAGS will be permitted in testing rooms, please speak with your student about leaving these items in their lockers. If you own an approved calculator, please bring it with you along with extra pencils. Be sure to label your personal calculator. Please visit the following website here for a list of approved calculators. If you have any questions regarding SAT School Day, please contact me at your earliest convenience. Thank you for your time, support, and unwavering commitment to helping us provide an equally rigorous and robust educational experience for all of our scholars. Additionally, if you are able to donate snacks please reach out to Ms. Donna Hollis at dyhollis@gmail.com. Snacks are needed by Tuesday, March 5th. Together, we will ensure that all students at the Duke Ellington School of the Arts achieve excellence!